This is how we celebrate Year of the Dog, Chinese New Year 2018. Hit Collins Street! with our fave clients and influencers clients, create the hottest hairstyles and colour and with the most handsome looking pups as arm candy. Get ready to drool! We’re ushering in February 2018 with so much than a token nod to our Asian and Chinese clients and to Chinese New Year. How about a full blown campaign photo shoot, featuring our fave clients and influencers Connie Cao and Hannie Choi, plus cameos from the cutest of pups (as it’s the Year of the Dog)! On a quiet Sunday in January, the team consisting of Creative Directors Danny, Chris, Colour Director Stevie and Senior Stylist Pasquale gathered at Rakis on Collins HQ, joined by the above influencers plus three of the cutest pups for a photo shoot. 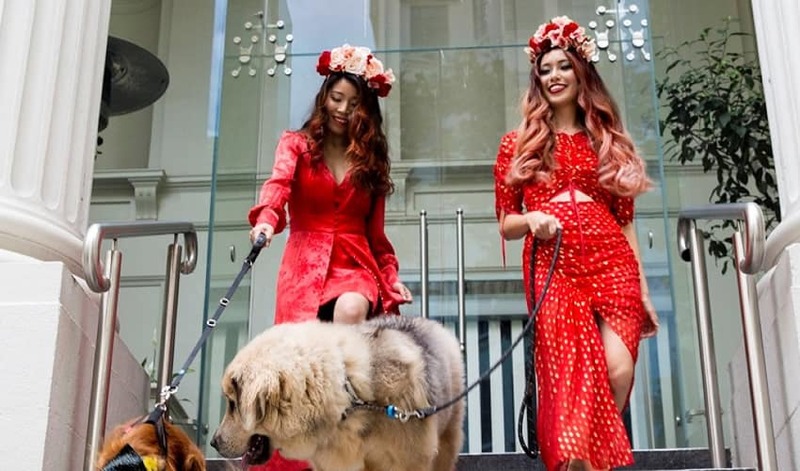 The brief was clear: The theme was Chinese New Year, red colour scheme and the pups as arm candy. Objective: STOP TRAFFIC on Collins Street! So what decisions were made with the hair style and colour? Colour Director Stevie shared the below tips. For Hannie’s hair colour, the team decided to gradually go lighter, but using permanent colour, in order not to compromise the condition. In addition, he said the team also wanted to utilise the underlying warmth to enhance the fashion colour, making sure the end result would complement her skin tone, the redness of the dresses, but also create a hair colour that is very wearable for every day. In execution, the team chose #COLORFULHAIR from L’Oréal Professionnel to create a Coral ombre for the final result, with her natural colour on her roots, powered by Smartbond. In addition to the hair, makeup and photography expertise from our own team, we had Connie prepare some headpieces and accessories, specially put together for the shoot. For those not in the know, Connie is a highly regarded entrepreneur on Etsy for her floral headpieces and a major lifestyle influencer on Instagram. Likewise, Hannie is major presence on Instagram as a beauty influencer. From beauty brands big and small, she shares her beauty knowledge to tens of thousands of followers. Having them front our Chinese New Year campaign is taking the Rakis on Collins brand to new fans and followers. For Creative Director Chris who was also doing the makeup and photography, not just the hair, his focus was more on connecting the Chinese New Year theme with the personal style of the salon’s creative team, making sure the execution of the hair colours worked with the bright and cheery personalities of Connie and Hannie. A big highlight for him was working with the dogs, as it was his first time working with pups, and nailing the connection between the talents, the dogs, the salon’s creative team while keeping the right mood and feel of the pictures were his top concerns. In terms of the execution of the hair, he wanted to deliver big movement, lots of brightness in order to make the pictures come alive visually, full of dynamism. He agreed that Connie’s headpieces definitely helped to enhance the final looks that he had in mind. With so much talent (and cuteness overload via the pups) gathered on one shoot, the results of the shoot can only be spectacular. So much detail in the outfits, the headpieces and artistry in the hair. The pictures are vibrant, visually rich and dynamic. Definitely far from a dog’s breakfast and every bit the creative project our clients would expect from Rakis on Collins. We really didn’t need Chinese New Year to launch a foreign language website. The staff at Rakis on Collins pride themselves on being very multicultural, having a Chinese language web presence feels 100% natural. In addition, our clientele come from all racial and cultural backgrounds, and nationalities in the over 30 years that we’ve been open, because the great hair that we do translates easily into any language. And check out this print ad in Vogue magazine where Salon Director Stavros was already featured in Chinese (see bottom right). For those who can speak and read Chinese, pop over to www.rakis.com.au/cn and see if we’ve nailed the lingo. Who knows, as we’re located on the Paris end of Collins Street, next up French, perhaps? How can we celebrate Chinese New Year without some fanfare in the salon? How about some fun, cheeky and always flamboyant predictions via our own fortune cookies, specially baked by our assistant stylist Aleah? Go ahead, crack one up, we’re sure that you’ll crack up to the nonsensical advice dispensed inside! On that note, the team at Rakis on Collins would like to wish everyone an auspicious and prosperous Chinese New Year! Gong Xi Fa Cai!